Answering the Clam Challenge: Which Shells for Which Beaches? Last May I posted this photo and caption on Wrack Line 2013. I hoped the caption might lead to the identification of this interestingly colored ribbed shell. No such luck however, so yesterday I posed the challenge again on the TOS Facebook page along with the additional views shown below. This is Corbicula, probably C. fluminea, the freshwater Asian clam. That’s right, the freshwater Asian clam. Here’s the beach where I found the Corbicula shell. So what gives? Corbicula is a freshwater clam with a vast worldwide range. The view above looks south to the mouth of a river that is probably inhabited by Corbicula. 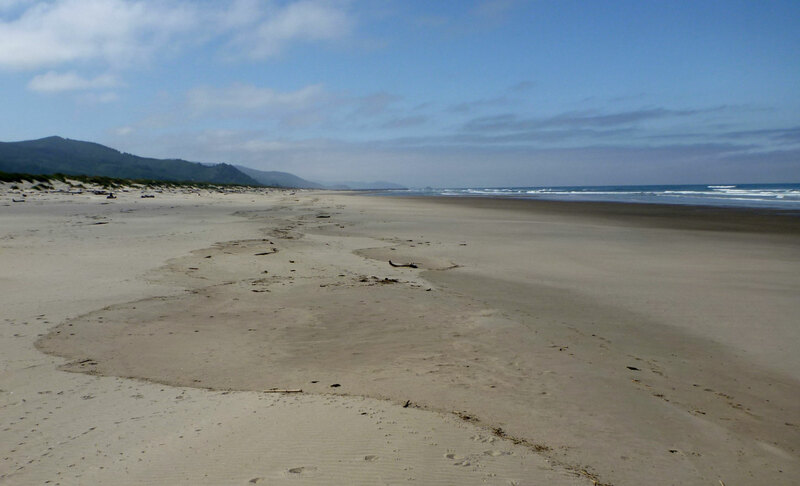 The most likely explanation for the occurrence of C. fluminea on ocean beaches is that they get mobilized by dredging or other activities upstream in their home rivers and wash downstream into the ocean, where some eventually wash up on the beach. In small rivers that’s not always a long trip because Asian clams range as low as the tidal freshwater reaches. If you want to learn more about Corbicula, the Wikipedia page is pretty good, and here’s what the USGS’s Nonidigenous Aquatic Species experts have to say. Acknowledgements. – Thanks to Paul Heimowitz and Robin Draheim for helping me confirm the identify of the Corbicula shell featured in this post and the likely mechanism for their occasional appearance on coastal beaches. I also want to acknowledge all the participants in the TOS Facebook quiz, especially Ken Oda who correctly identified this shell as Corbicula. Thanks for the interesting article on .C. fluminea. Made me do some research to see if it has been found on Vancouver Island where I live. To my surprise the first NA record was from shells collected at Nanaimo in 1924 and now in the collections of the Smithsonian Museum of Natural History. Nanaimo is on Vancouver Island only 30 minute drive from where I live. Then on Nov 26,1989, shells of C.fluminea were found in beach drift near the high tide line in Stanley Park, a large urban park in Vancouver, BC. Those shells are in the collections of the Royal BC Museum in Victoria, BC. Shells have also been found in 2008 at a lake near Victoria (on Vancouver Island) and in the Lower Fraser River. So the species is probably established in southern BC, although that has not been confirmed. This must be about the northern limit of the clam as it needs water temp. of about 16C to spawn. Interesting information. Thanks! I didn’t know about the early record from Nanaimo. I knew they were known from the Columbia River by the 1930s and that there were some earlier records in the Pacific Northwest, so the Nanaimo record helps paint the picture. Since I started thinking about Corbicula, you are the second person to bring other records of their occurrence in marine drift to my attention. 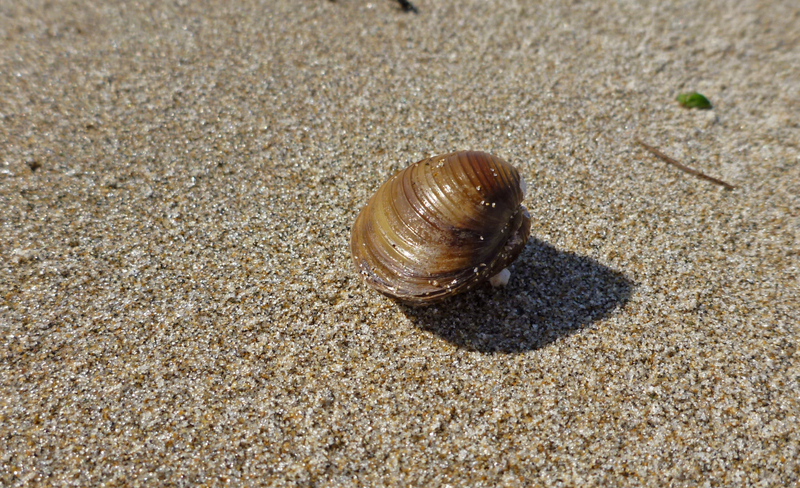 As explainable as it is, it still seems odd to go to a coastal beach and find a freshwater clam shell.